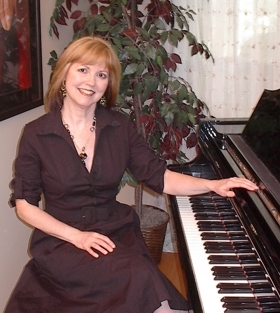 Debbie Fox, foxmusic.ca | Piano, Voice, Theory lessons. Sign Up Now, Time ! Evaluation of the level of your musical skills to determine the teaching criteria. Discussion of what your goals are musically. Discussion of what you are looking for in a teacher. Outline of my teaching methods. I am dedicated to improving my teaching skills by attending as many seminars as possible and by communicating with other teachers. As a teacher, I will never stop learning and always strive to be better. Through my musical development I was heavily immersed in competitions, performances and exams. This experience is crucial in understanding the challenges and preparations for students in these areas. My students are very successful in RCM examinations and the Peel Festival. It’s not easy to perform for your peers and I’m very proud of them. Learning proper finger technique while having fun is important and possible! Having done a lot of solo work and acquiring Grade 10, I am very familiar with what nervousness can do to the vocal instrument. Techniques used to overcome nervousness are very effective, from breathing, open voice, vowel formation etc. It is very rewarding for me to see my students develop proper technique and when they realize what a difference it makes to vocal production, I am quite proud of them. When you speak a language, it is also important to know how to write and read it. This is a fundamental right for everyone. It is the same with music. To fully understand a piece/song, it is important to know how it is put together to interpret it properly. Being able to read music opens a huge availability for expanding one’s repertoire. If you hear music that you would like to be able to play, wouldn’t it be great to simply purchase the sheet music, read it and perform it yourself! As you develop with theory education, you can eventually hear the music and go directly to playing it by knowing the harmonies when you hear them. For singers, hearing the melody and knowing the direction the notes are taking is a result of sightreading, ear development and, of course, a structured theory education. For songwriters, an understanding of how music is put together is cruclal. If someone else writes harmonies for your melody – or writes your melody and harmony – chances are good that it won’t sound the same as what you are hearing and you won’t have full ownership of the music. Theory is an important element in a musician’s development.